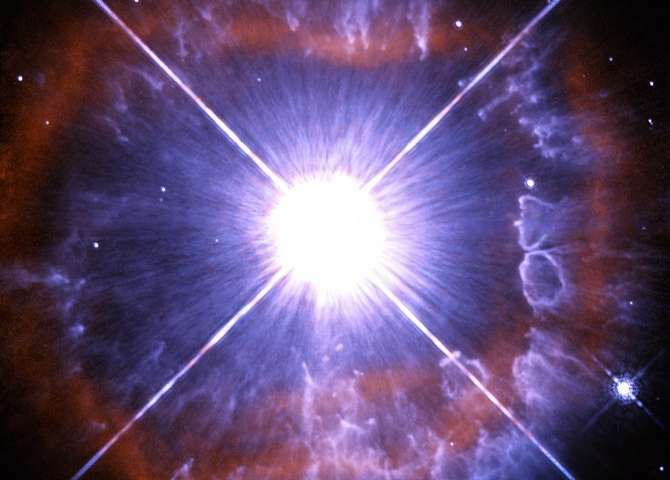 This luminous star, AG Carinae, is losing mass at a phenomenal rate. Its powerful winds reach up to seven million km/hour, and exert enormous pressure on the clouds of material already expelled by the star. These incredible winds have already cleared a region immediately around the star, and sculpted the material further away into the pattern observed in this Hubble Space Telescope image. AG Carinae is a rare breed of Luminous Blue Variable star that evolved from a star around 50 times the mass of our Sun. They show variable and unpredictable behaviour, experiencing periods of quiescence and outbursts alike. They are also some of the most luminous stars known: tens of thousands to several million times as luminous as the Sun. It is worth noting that the bright glare at the centre of the image is not the star itself, which is tiny at this scale and hidden within the saturated region. The white cross is also not an astronomical phenomenon but rather an effect of the telescope. AG Carinae lies 20 000 light-years away in the constellation of Carina. The image was taken with the Hubble's Wide Field and Planetary Camera 2, and was first released in September 2014. Astrophysicists and astronomers wouldn't know a plasma formation if they saw it, and this article proves said point beyond a shadow of the doubt.